Last major update issued on December 7, 2005 at 04:40 UTC. 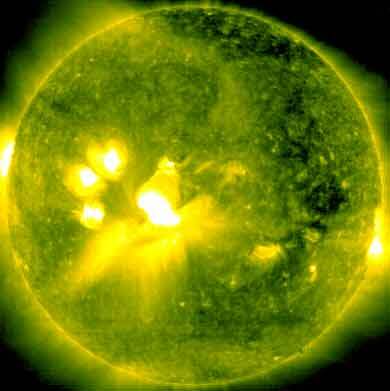 The geomagnetic field was inactive to very quiet on December 6. Solar wind speed ranged between 353 and 427 (all day average 375) km/sec. Three hour interval K indices: 00111011 (planetary), 00122111 (Boulder). Region 10826 decayed quickly and is losing its trailing spots. Region 10828 decayed further and could become spotless today. Region 10830 was quiet and stable. 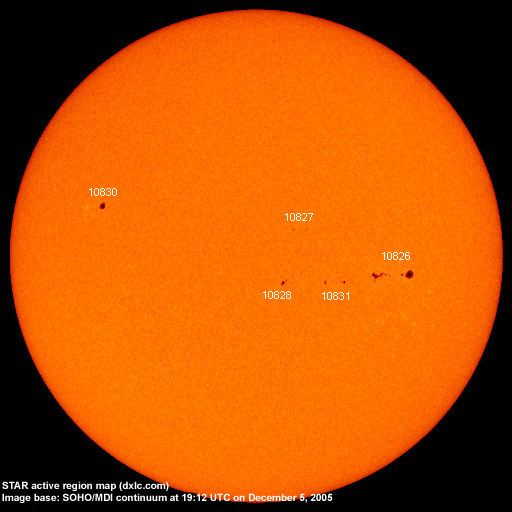 December 4-6: No obvious partly or fully Earth directed CMEs were observed. The geomagnetic field is expected to be mostly quiet on December 7-9. Long distance low and medium frequency (below 2 MHz) propagation along east-west paths over high and upper middle latitudes is fair. Propagation on long distance northeast-southwest paths is poor. Trans Atlantic propagation conditions are normally monitored every night on 1470 kHz. Dominant stations tonight: WLAM Lewiston ME and Radio Vibración (Venezuela). Stations from the eastern parts of the USA and from Puerto Rico enjoyed the best propagation.